This chapter introduces the JavaFX embedded browser, a user interface component that provides a web viewer and full browsing functionality through its API. The embedded browser inherits all fields and methods from the Node class, and therefore, it has all its features. The classes that constitute the embedded browser reside in the javafx.scene.web package. Figure 2-1 shows the architecture of the embedded browser and how it relates to other JavaFX classes. Description of "Figure 2-1 Architecture of the Embedded Browser"
Two constructors enable you to create a WebEngine object: an empty constructor and a constructor with the specified URL. If you instantiate an empty constructor, the URL can be passed to a WebEngine object through the load method. 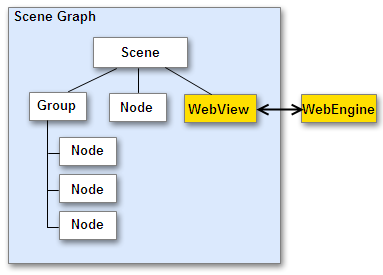 The WebView class is an extension of the Node class. It encapsulates a WebEngine object, incorporates HTML content into an application's scene, and provides properties and methods to apply effects and transformations. The getEngine() method called on a WebView object returns a web engine associated with it. Example 2-1 shows the typical way to create WebView and WebEngine objects in your application. If the method returns the web engine of the same WebView object, the target document is opened in the same browser window. To open the target document in another window, specify the WebEngine object of another web view. When you need to block the pop-up windows, return the null value. When working with the WebView component, you should remember that it has the default in-memory cache. It means that any cached content is lost once the application containing the WebView component is closed. However, developers can implement cache at the application level by means of the java.net.ResponseCache class. From WebKit perspectives, the persistent cache is a property of the network layer similar to connection and cookie handlers. Once some of those are installed, the WebView component uses them in transparent manner.